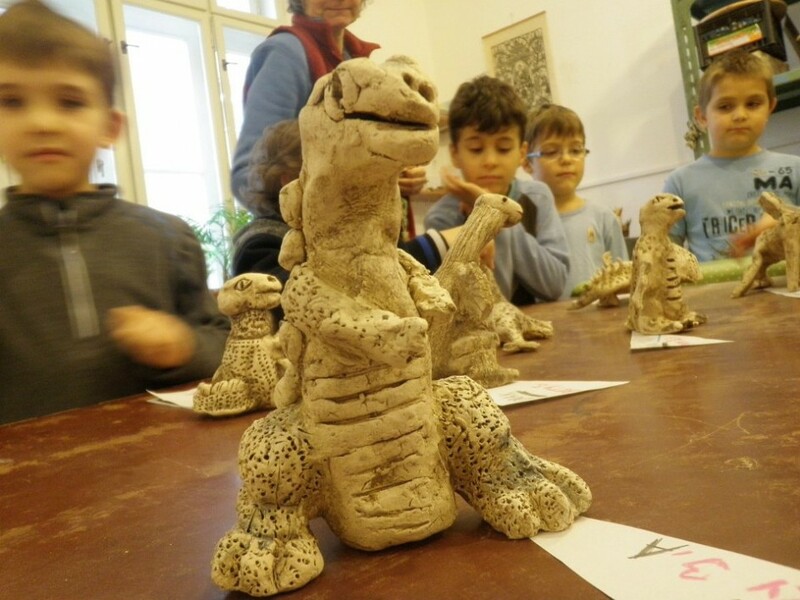 Pupils attending the ceramics club organized an exhibition of ceramic dinosaurs for children, teachers, and parents. Seventh-graders made a video documentation of the exhibition and created several short films in Movie Maker program. Pupils of the first, second, and third grades attend the school ceramic club and are seriously devoted to modelling. For their schoolmates, they created clay models of dinosaurs and organized an exhibition in the ceramic workshop. For their work, they drew knowledge from a visual encyclopedia of prehistoric animals. In this book, they became familiar with their anatomy, external appearance, and way of life. As children love fantastic tales of dragons, lizards, and reptiles, they accompanied their models with such a story, which the exhibition visitors could read. The exhibition was attended by all pupils of the first to fifth grades, which is around a hundred children. At the opening of the exhibition, authors read their stories and discussed with visitors the animal life in prehistoric times, passing on their knowledge to others. Seventh-graders made a video documentation of the opening and edited a short film in Informatics classes. They used the basic program for creating videos Movie Maker, with which some of the pupils had had no previous experience. During the project, all the seventh-graders learned to edit a film from few shots, insert transition effects, titles, and music. This gave rise to several minor digital objects. The photographic documentation of the exhibition was made by a science teacher. The biggest problem was to cut all video material made in ceramic workshop to make a short film and to sound it. The biggest problem was to use video camera properly, to have a sharp picture. The biggest problem was to make the right settings for the video camera. We worked with digital camera and video camera. The film was processed in the program Movie Maker, which we had never worked with before. I learnt to work in the program Movie Maker, to make subtitles and sound tracks. I learnt how to film activities at school. I would definitely make more records of the children at the exhibition. I would better prepare the film script, but during the reportage it is quite difficult.